Well ladies and gentlemen it’s the moment my daughters and I have been excitedly, yet anxiously awaiting. As you are reading this post we are on the road driving to Las Vegas. And I’m also happy to report that Travel Man is our chauffeur this weekend. I’m so glad he was able to make it home to join us. Now, mind you it is not my normal modus operandi to pre-blog about an event, but this trip is worth giving you a little sneak peek. For Christmas last year my kids gave me tickets to see Celine in Vegas, in February, with my daughters. This is a dream come true for me. One of those items on my bucket list, as I have always followed Celine’s music, and love her singing. In February the girls and I make a weekend of it. We leave for Vegas on a Friday after the girls are off of work to stay for two nights, as the show was on Saturday night. The girls do some zip-lining down Fremont Street (and no I did not join them, thank you very much), and we had a great time hanging out together Saturday morning. 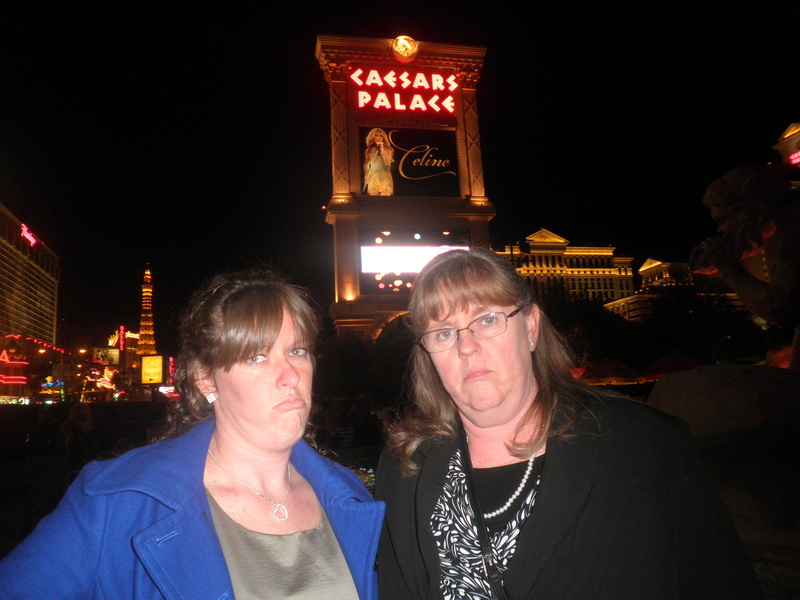 Our sad Celine faces. Notice the billboard in the background. As we are eating lunch on this particular Saturday, in February, I decide to check on the internet to see how long the show would be so we could make plans for after the show. And ugh! I found out that Celine has had to cancel her shows due to a virus. Boo-hoo! We were soooo disappointed, but daughter, Hilary, got right on the phone and got the tickets re-scheduled to the June 9th show. We ended up having a nice dinner Saturday night and made our way home on Sunday morning as originally planned. So, today is June 9th. Celine’s return to the Colosseum at Caesar’s palace in Las Vegas. We are hoping for a fabulous, fantastic show that will knock our socks off! And if each of you could send us a little good juju (and if you’re a baseball fan you know what I’m talking about) we know that the show will go off without a hitch. We’re keeping our fingers and toes crossed, and will report on our triumph after the weekend, with pictures of course. can you actually cross your toes mother? Why of course. I’m very multi-talented. Thanks for stopping by Zach.